For Alhambra High School Alumni who are starting to show a little gray around their temples this should bring back a flood of memories and have more meaning to you than our alumni of later years. However there is one thing constant about time – it keeps moving on. So for our younger readers relax and take a step back in time and enjoy some history and spirit of our wonderful high school and community. As a member of the Alhambra graduating class of 1973, while in our freshman wonder years at AHS many of us looked upon the Old Alhambra Union High School Building with much fascination. The year before had seen the last classes, although limited in scope, to use this grand old building. It had been reclassified as the “T” building, meaning temporary like the wooden portable buildings, which stood beside her in the parking lot. 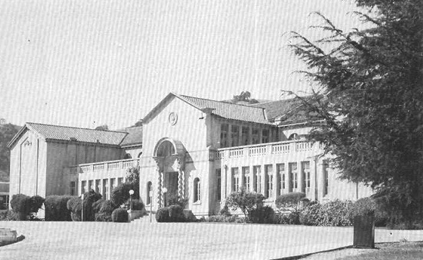 This, the second Alhambra Union High School, was located on the present site of the current high school and was a Romanesque-style building. It was built in 1921 to accommodate a growing town and its students. The cost of this building in bonds was $175,000. Ground breaking for the new high school, located on Smith Street (now Alhambra Ave), was on March 24, 1921. The builders, Munson Brothers of San Francisco, had been awarded the contract. Classes began in the newly completed high school on January 16, 1922. The final cost at completion was $185,000. The walls were of reinforced concrete, with a red tile roof. The auditorium would seat 850 and the building was 250-feet long with two stories. I can remember looking through the windows – with great wonder and fascination – of this historic and stately old building my freshman year. Wonder of its history and those who came before us walking these halls. As I looked through the windows of this lovely building I could see the desks still in place and assignments still posted up on the blackboards. The clocks still clicked in time with the master controller clock now located in the new administration building. The bells still rang between periods, and the PA system fired up each and every morning, through every hallway, empty classroom, shop, and theatre with Vice Principal Moe Williams reciting the Pledge of Allegiance. It was almost haunting. How I yearned to walk down those halls, if only once. But the building had been locked and sealed never to be entered again. At the end of our freshman year they brought in the wrecking ball to take the old building down to its very foundation. We were told that the building was not built to current earthquake standards and that we had new permanent buildings to replace it. There just was no more use for a building that had served its time. As the demolition commenced the Gazette ran articles on the delays due to the building being built so strong that the wrecking ball had met its match. Even the furnishings in the old building had not been removed – they were demolished with the building as they were obsolete and new furniture was provided for the students. When we returned from our summer vacation to start our sophomore year all that was left was the building corner stone and a few miscellaneous blocks that stood like as centerpieces on the new friendship lawn. The stone and old photographs were all that was left as a reminder to graduates of the past – those who once walked those stately halls, and learned in those well-lit classrooms. In 1962 a new administration building was built to replace the 1921 structure. Although it was functional, it never shared the beauty of the previous school. The next building lasted until 1993, and then it met the same fate as the second Alhambra High School built in 1921. Through the foresight and vision of kind and generous citizens of Martinez a new building, resembling the original school, was erected on the spot of the old “T” building as an honor to our history, pride and heritage. In June 1988 the voters of Martinez passed a $25 million bond, by a three to one margin, to build a new AHS reminiscent to the architectural style of the beloved 1921 structure. The newest high school was dedicated on May 14, 1994 at the new clock tower. This and over a thousand other stories about AHS and Alhambra Union High School, its Alumni as well as stories about the Martinez Unified School District, early Martinez education and the Martinez community can be found on the Alhambra Alumni website at www.AlhambraAlumni.org.